We've probably all had a really terrible headache or migraine at some point in our lives. They're the worst. I don't personally suffer from migraines on a regular basis, but I feel terrible for people that do. That pain is just crippling and sometimes nothing seems to help. I have some good news and some bad news when it comes to migraines. I'll start with the bad news: Migraine attacks can be triggered by a range of factors. What does that mean? It means that figuring out what's causing the migraines or headaches in the first place can be a bit tricky. It could be anything from food, drops in blood sugar, medications, odors, dehydration, allergies, stress, tension, and even changes in sleep patterns. The good news is I can help at least in the food, dehydration and maybe even sleep departments. First of all lets determine the difference between a migraine and a headache. 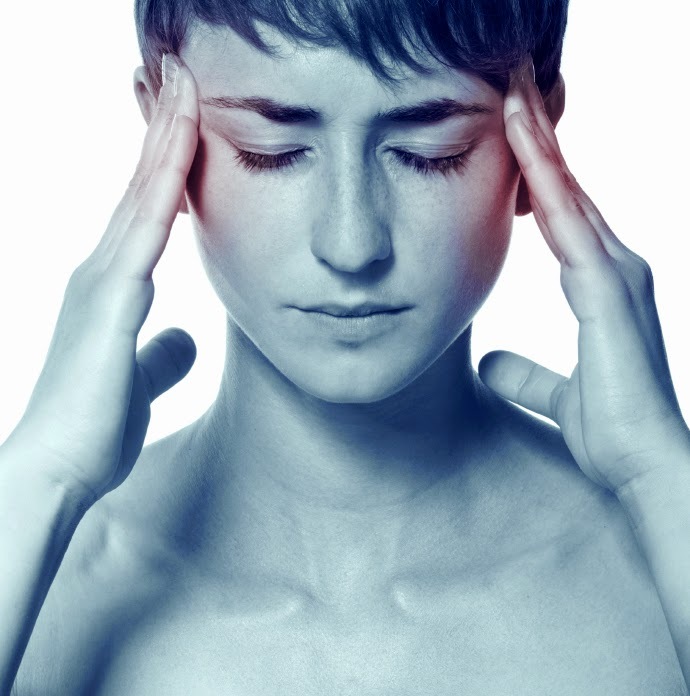 A migraine is defined clinically as an episodic intense, throbbing head pain that lasts form 4 to 72 hours. It is usually on one side of the head and becomes worse with exertion. Along with the throbbing head pain you might experience nausea and it's usually associated with visual disturbances or unusual smell perception. All of that basically means it freaking hurts, lasts a long time and light and smells can make it worse. Headaches are really just defined as continuous pain in the head. They still hurt, but there's probably no comparison to the pain you feel if you're experiencing a migraine. So nutritionally what can you do to help and prevent them? First step, look at your water intake. Not just the amount, but the timing of it too. Wondering how much water you should be taking in on a daily basis? A good place to start is half of your body weight in ounces. For example, if you weigh 140 pounds you should drink 70 ounces of water a day. Working out or excessive sweating would cause you to need more, so keep that in mind. And the timing part of it... Try to drink your water pretty evenly throughout the day. It won't do too much good to drink 70 ounces at once. Spread it out and you might see your headaches and migraines disappear. So you've looked at your water intake, what's next? Before we get into the food part lets talk about sleep. The lack of sleep can trigger a migraine or a headache. Do your best to get good, consistent sleep every night. Another trigger can be tension and stress, so if you find yourself stressed out try eating little and often and drink that water! Do something relaxing and try to ease your stress as best as you can. Finally the food part. If you've looked at all the other angles and are sure you're getting enough water and sleep it could be that something you're eating is triggering those pesky migraines. Start by seeing if you can notice any correlation between the foods you eat and the incidence of headaches. A good place to start is looking at stimulants like sugar, tea, coffee and chocolate. Starting a food journal might help. On the days you get a bad headache write down everything you ate and over time you'll be able to see if there's any kind of pattern. If you think something in particular is causing it try completely eliminating that food from your diet for two weeks, then reintroducing it and see what happens with your headaches. If they go away and come back, that's a pretty good indicator that's a trigger food for you. If they never went away in the first place then you can be pretty sure that it wasn't causing them. The thing about trigger foods is that they're different for everyone. What causes headaches for you might not cause a headache for others so doing an elimination diet is really the only way to pinpoint what your triggers might be. What can you do when a migraine hits? Try a dose of vitamin B3 in the niacin form. Start with 100mg and if you don't see improvement try 200mg. Vitamin B3 is a vasodilator (meaning it dilates your blood vessels) and can be super helpful in stopping a migraine in it's early stages. Supplementing with Magnesium has also been shown effective in treatment. A good place to start is making sure you're taking a good multivitamin every day. Hopefully this helps you find some relief.